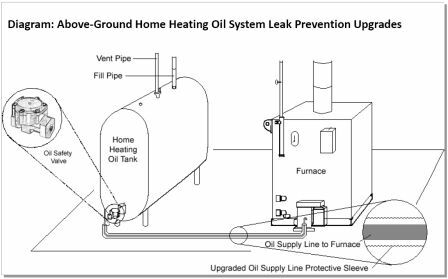 insurance companies that write Massachusetts homeowners policies to offer coverage for leaks from heating systems that use oil. Most homeowner policies do not include such coverage, leaving many to pay for costly cleanups out of their own pocket. Although it is mandatory that insurance companies offer this coverage, the coverage is an optional purchase for homeowners, and is NOT automatically included on a standard homeowner policy. The effective date for both provisions is July 1, 2010. A list of licensed technicians to get you in compliance can be viewed at http://db.state.ma.us/dps/licenseelist.asp. For more information about this new law, please visit the Massachusetts Department of Environmental Protection website at http://www.mass.gov/dep/cleanup/laws/hhsl.pdf. Insurance carriers are presently filing for this new insurance coverage as we speak to be ready for the July 1st deadline. To find out more about the coverages available to purchase, please call our office at (978) 365-2302 or visit www.koinsurance.com ! Over the last few years, many insurance companies have started using credit information to help determine what a customer pays for an insurance policy. In fact, over 90% of insurance companies use insurance scores, according to a study by Conning Research and Consulting Inc., a Hartford, Conn.-based research firm. To help you better understand how your credit-based insurance score is calculated and how that “score” impacts what you pay for your policy, we have developed the following list of frequently asked questions. Please note that the use of insurance scores varies by state. An insurance score is determined by reviewing a consumer’s credit history. A carefully developed and tested computer model performs this analysis, and looks at information such as payment history, whether you have filed for bankruptcy, if you have bills with a collection agent, any outstanding debts you may have, and the length of your credit history. Unlike a “credit score,” which is typically used when you are seeking a loan, an insurance score is used to help insurance companies accurately assign the best price available for your policy. When calculating your insurance rate, insurers typically group consumers into categories. For example, driving record and age are the most often used categories to help calculate the cost of a customer’s auto insurance policy. Insurance scores are just another method insurance companies use to determine what you pay for your policy. According to extensive industry and independent research, people with certain patterns in their credit history that result in a lower insurance score are more likely to have claims that need to be paid by their insurer. For instance, keeping your credit card balances below the maximum limit and making regular, on-time payments will result in a higher score. On the other hand, if you have a history of “maxing-out” your credit cards to their limits and submitting payments late, your score will be negatively impacted, meaning a lower score. An insurance score DOES NOT take into account income, race, gender, religion, marital status, national origin, or geographic location. It only reviews your credit history. Since insurance scores have been proven to be highly predictive of the potential for future losses, they help insurance companies determine the likelihood that a customer will file a claim, and thus allow carriers to set rates that are accurate and appropriate for each customer. This enables carriers to offer insurance coverage to a broader range of customers. What’s more, many of these customers benefit from the use of insurance scores in the form of lower prices. Insurance scores are used in the same way as other traditional underwriting factors. As a group, people with certain patterns in their credit history receive lower insurance scores and are more likely to experience a loss and file a claim. They are charged a higher premium to reflect that risk. This allows Travelers, and other insurers, to give better rates to consumers with higher insurance scores, who are less likely to file a claim. Credit history helps predict the potential for future losses, but it is not the sole factor in determining the cost of your policy. It is one of several factors used to arrive at the best rate possible. The age of a driver and prior claim history are two other important factors that are also used to determine your rate. Travelers recognizes that sometimes people face difficult circumstances, such as medical collections, divorce, or job loss. We have created an Insurance Scoring Resource Center (ISRC) to assist our independent agents and customers with issues like this. In most cases, an isolated instance of a late payment will not have a significant impact on your insurance score if you otherwise have an established pattern of responsible credit use. Your Travelers agent will contact the ISRC on your behalf if you have questions. How does Travelers use my insurance score? Travelers uses your insurance score together with a number of other factors (including the factors mentioned above) to determine the best pricing level available to you. Generally speaking, customers who have higher insurance scores and no prior claims or accidents, qualify for our best price. For those customers with prior claims or accidents, a higher insurance score will help them qualify for a better rate than a similar customer who has a significantly lower insurance score. In turn, customers with no prior accidents or claims, but who have low insurance scores, may also qualify for a competitive rate. Numerous federal and state laws and regulations are in place to protect you. Under federal law, if the information in your credit history results in an “adverse action,” by a company, that company must notify you and inform you about how to obtain a free copy of your credit report. You will also be provided with a description of your right to dispute the accuracy or completeness of your credit history. No. Your agent will be informed of your overall score when the policy proposal is created, but will not have access to the underlying information used to calculate that score. One of best things you can do is to make sure you pay your bills on time. That will help little by little with your credit history. You can also review how much credit you have. Are you up to your limit on a credit card? If so, that may also be considered an unfavorable factor. Consider how to reduce your debt without creating additional credit activity. Also, review your credit report regularly. Resources such as the American Insurance Association provide additional information about how to improve your credit history. Click here for a list of some ways to improve your insurance score. You are currently browsing the Koinsurance's Blog blog archives for May, 2010.